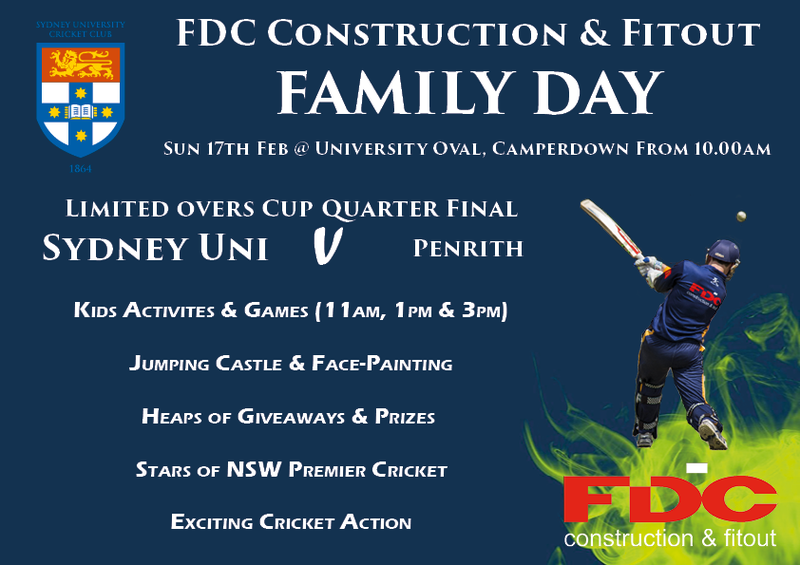 Sydney Uni Cricket are pleased to announce that its inaugural Family Day, proudly brought to you by FDC Construction & Fitout, will be held on Sunday 17th Feb 2019 in conjunction with the NSW Premier Cricket Limited Overs Cup Quarter Final at University Oval. Thanks to FDC Construction & Fitout, we will have plenty of activities for the kids, including cricketing challenges, face painting and a jumping castle. There will be heaps of giveaways and prizes, not just for the kids but for parents as well. If that isn't enough reason to join in the fun, there will be a fiercely contested Limited Overs quarter final between Sydney Uni and Penrith from 10am. The two sides are fighting it out for the Club Championship at the moment, and have already met twice in the T20 Cup earlier this year (with Sydney Uni victorious in the Sydney Thunder Conference Final). Some of the best cricketers in Australia will be on show during the match, with plenty of exciting cricket action on display. Check out our highlights video below. Show your interest by either registering to attend on our website or our Facebook Event page. Follow the event on Facebook for any updates. One lucky registered attendee will win a $150 prize pack thanks to FDC Construction & Fitout and Sydney Uni Cricket.